Oh, trust me, the Mets really do. Mets fans seem to look at Travis’s 2016 season like Carlos Beltran taking an Adam Wainwright curve in 2006 to end the NLDS. What I’m saying is, fans seem to have a selective memory & I can’t seem to figure out why but when it comes to the Mets catcher, get over it. If you want to hate him sure go ahead & let him at least have a terrible tenure followed by a trade. But till then, again, just get over it. So far this spring, TdA is batting .400 with 2 HR’s & 4 RBI’s so I’d imagine a lot of fans are telling themselves “oh I knew he’d turn it around” when they were really begging for an upgrade just a few weeks prior. But the Mets have a stacked line up & they need 1-8 to produce in some form or fashion. I’d imagine Travis will be batting 7th so I figure he should get a lot of good pitches to hit. But it’s not just about what he does offensively, d’Arnaud needs to have the rotation & pen fully confident in his ability to call a game. Not only did d’Arnaud struggle offensively in 2016 but Rene Rivera was also getting a lower ERA from his pitchers while he was catching games. While many fans & critics like to fault d’Arnaud for all the stolen bases taken against the Mets, most coaches & players will tell you that stolen bases are mostly a result of how quick or how slow the pitcher is to the plate. While the catcher does deserve some responsibility, bases are stolen on pitchers, not the catcher. I definitely view this is a make or break year for Travis, at least when it comes to being in a Met uniform. 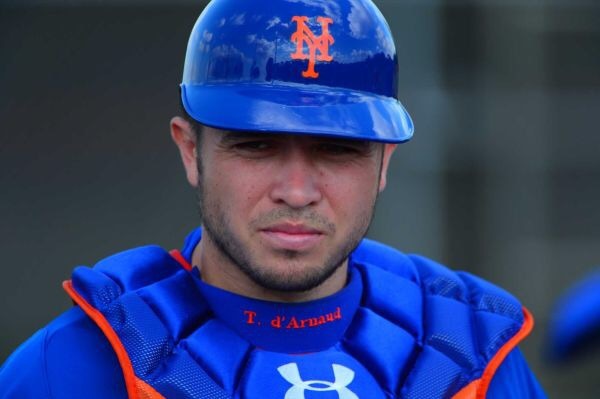 If the Mets can get TdA to look more like he did in 2015 with some improvement, the Catching position is one less thing to worry about moving forward. I do expect d’Arnaud to be a candidate for “Comeback Player of the Year” as well as do I expect him to do better than he did in 2016, but I also figure he’ll be better than he was in 2015 also. In 2015, d’Arnaud bat .268/.340/.485 with an .825 OPS. He had 12 HR’s while driving in 41 runners in 239 AB’s.